eBay has changed the way products and services are purchased all over the world. Daily over 1.5 million online customers and providers log on to bid and sell virtually anything that can be bought or purchased. This expertly written book will show you how to take advantage of this business phenomenon. eBay has changed the way products and services are purchased all over the world. Daily over 1.5 million online customers and providers log on to bid and sell virtually anything that can be bought or purchased. In 2006 eBay sellers are estimated to post $22 billion in sales. There are businesses earning $1 million a year selling products on eBay today. 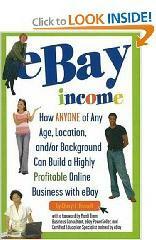 It is estimated that more than half a million people make full-time incomes just with their eBay business. eBay also allows you to run a business that requires no advertising costs. This expertly written new book will show you how to take advantage of this business phenomenon and arm you with the proper knowledge and insider secrets. Filled with actual examples and antidotes from real eBay entrepreneurs, this book is as engaging as it is informational. eBay is a level playing field - it doesn’t matter how old you are, what nationality or income level, whether you own a business now or not, what your background is, or where you are located. Start making money on eBay today! The book starts with a complete overview of how eBay works. Then you are guided through the whole process of creating the auction and auction strategies, photography, writing copy, text and formatting, managing auctions, shipping, collecting payments, registering, About Me page, sources for merchandise, multiple sales, programming tricks, PayPal, accounting, creating marketing, merchandising, managing e-mail lists, advertising plans, taxes and sales tax, best time to list items and for how long, sniping programs, international customers, opening a storefront, electronic commerce, buy-it now pricing, keywords, Google marketing, and eBay secrets; everything you will ever need to get started making money on eBay! Reader Andy Rosenblum or Wilton, New York says,"eBay income, by Cheryl Russell is unique among the hundreds of books on the subject, in that it takes the reader on a step by step journey through the process of learning how to sell on eBay, without overloading them with difficult to understand language that is so prevalent in other books on eBay selling.